Four times as sweet as standard hybrids. Garden-fresh sweet corn is summer's greatest pleasure. Supersweet Hybrid Sh2 corn can be twice as sweet as others. Enjoy the 8" ears of corn 48 hours after picking, and they are four times as sweet as standard hybrids and will stay sweet for days if chilled promptly; and it's good for freezing, too. Proven tops for productivity, flavor and wide adaptability. Eating fresh sweet corn is one of the greatest delights of summer. See how easy it is to grow your own. 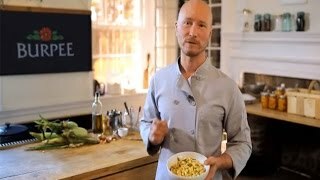 Chef Ian Knauer of the Farm Cooking School in Stockton New Jersey Prepares Raw Summer Corn. Growing corn is easy provided you have enough space and plenty of sun. Corn is wind-pollinated, so you need to plant in blocks to ensure pollination. You should have a minimum 10 foot by 10 foot area. The exception to this rule is ‘On Deck’ corn, which has been bred to grow in containers. If you are growing ‘On Deck’, choose a container that is at least 24 inches wide and deep and plant nine seeds evenly spaced. Corn is classified as Sh2, SE, SU, or SY. These refer to the sweetness and how long the corn may be stored. Sh2 is is supersweet, lasts 4-6 days in the refrigerator and is more challenging to sow in cool soils; SE is sugar-enhanced and lasts over a week in the refrigerator; SU is normal sugary, more cool soil tolerant but with a shorter shelf life; SY combines SE and Sh2 traits. Isolate Sh2 corn varieties from others by planting seeds at least 250 feet apart, or select varieties that mature at least 2 weeks apart, so they will not cross pollinate. When choosing a site for corn, plant on the north side of your garden so the tall plants do not shade other plants in your vegetable garden. Corn is a warm season crop and should not be planted in cool soils. The non Sh2 varieties tend to be more tolerant of cool soils, but in general the soil should be about 65 degrees F or warmer. Sow corn seed 1 inch deep, 5 to 6 inches apart in rows 2 to 3 feet apart. When corn seedlings are 3-5 inches tall and healthy, thin to 1 foot apart. Keep plants well watered during dry periods to promote uninterrupted growth. Corn needs 1-2 inches of rain per week for best production. Use a rain gauge to check to see if you need to add water. Corn is also a heavy feeder and will benefit from side dressings of fertilizer applied as directed through the growing season. Suckers tend to form at the base of the plants; they help support the stalks and make food for the plant. The stalks may have to be staked in windy areas, but in general they are self-supporting. Sunflowers are good companion plant for corn. Direct sow sunflowers in rows parallel to corn rows to help separate corn varieties that need isolation from each other. Choose sunflower varieties of comparable height to the corn plantings. The sunflower border, with vibrant hues in russets to golden-yellow, will add sparkle next to the almost all-green corn plot. The ‘Three Sisters’ (corn, bean and squash) are traditional companion plantings with Native American gardeners. Ears of corn are ready to harvest about 17-20 days after the silks appear. The kernels should be firm. Open an ear and pierce a kernel with your fingernail. If the liquid is watery, the corn is not ripe yet. It should be milky. If it is creamy, it is overripe and will not taste as sweet. Firmly grip the ear and twist downward to harvest. Take care not to break the plant when harvesting the first ear, or the second ear will not develop. 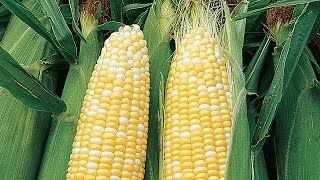 Most corn produces two ears. Store unhusked corn in the fridge and consume as soon as possible. Sh2 and SE varieties keep the longest in the fridge, up to one week. Corn freezes well after blanching and may also be canned using a pressure cooker. Immature ears may be pickled. Corn, Illini Xtra Sweet Hybrid is rated 3.4 out of 5 by 18. Rated 5 out of 5 by ChasP from Best corn ever simple to grow. almost every seed comes up. Tastes great. no milky taste. Sharp snappy ans sweet. I am done with other varieties. Rated 5 out of 5 by Thumbhavethnogreen from Wildlife loved it Seed grew quickly and rabbits and raccoons loved the corn. Growing stuff is hard! Rated 5 out of 5 by karenann414 from Best variety ever I have planted Illini Xtra sweet for years. My family won't eat any other variety. The year I planted a different variety I had to throw it all away. Rated 5 out of 5 by Stewart from the best I have ever grown. Grew 10 feet tall and had a large ear on every stalk. Some had 2 ears on a stalk. Rated 2 out of 5 by Speyman from Subpar Planting this year......? We have grown this corn for over 40 years out here in Idaho. Know the history of the variety [Foundation Seed at U of I] from our time living in Illinois. However, this year's results have been noticeably subpar. Only about 20% of our plants actually bore ears (all produced tassels). A large percentage of the ears that did appear were nothing but "runts". I did nothing unusual in my planting this year. Four rows about 50 feet long, planted two at a time, 3-weeks apart. Hills about 15" apart. Rated 5 out of 5 by Mamabug14 from Excellent corn! This corn did amazingly well in my garden. The stalks grew nearly 10 feet tall and were absolutely loaded with huge ears of corn. It is sweet and absolutely delicious! Rated 1 out of 5 by Chuck Z from Deserved a Zero I am 52 years old. I grew up on Illini sweet corn. For the past 3 years, I have bought seed at a local store. They stopped carrying it and was forced to purchase online. Ordered from Burpee because of their long history in the seed/gardening business. I ordered a packet of 200 seeds....and I did NOT get a single ear from them. Only 10 produced a plant above ground. Very poor seed. I will never buy from Burpee again.